Bob Tasca raced to the No. 1 qualifying position in Funny Car Saturday at the Ford NHRA Thunder Valley Nationals presented by Tri-Cities Area Ford Dealers. Brandon Bernstein (Top Fuel) and Allen Johnson (Pro Stock) also will lead their respective categories into Sunday’s noon eliminations as No. 1 qualifiers at the NHRA Full Throttle Drag Racing Series event. Tasca set both ends of the Bristol Dragway track performance record with a powerful pass of 4.056 seconds at 314.31 mph in his Motorcraft/Quick Lane Ford Shelby Mustang. It is Tasca’s second No. 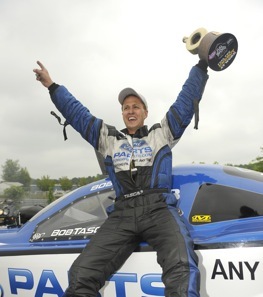 1 qualifying position of his career and first since taking the top spot at the 2009 Gatornationals. He will face rookie Daniel Wilkerson in the opening round of eliminations. Just before the final qualifying session a thunderstorm front moved through the Tri-Cities area and created cooler conditions, which in turn produced a few track record performances, including two for Tasca. Southwest Virginia cattle rancher Matt Hagan was second with a 4.082 at 308.07 in his DieHard Dodge Charger, while series points leader Mike Neff, 2008 runner-up at Bristol and a finalist in the last four races, was third with a 4.085 at 311.99 in his Castrol GTX Mustang. Tasca’s first opponent will be Daniel Wilkerson, the son of veteran Funny Car driver Tim Wilkerson. In Top Fuel, Bernstein held on to claim his first No. 1 qualifying position since 2008 in Memphis. Bernstein posted a track record time of 3.828 at 316.52 in his Copart dragster to earn his 14th top qualifying position and third at Bristol Dragway. He will face rookie Austin Lambright in the first round as he tries to end a winless drought that dates back to Richmond 2009. Larry Dixon had moved into the top spot during the final qualifying session, however the Copart dragster proved to be quick enough to take the top spot back in a thrilling final run of the evening by Bernstein. Defending world champ Dixon settled for second with a 3.831 at 319.37 in his Al-Anabi Racing dragster and the winner of the last two events, Spencer Massey, was third with a 3.852 at 321.73 in his Prestone/FRAM dragster. In Pro Stock, local favorite Johnson, from nearby Greeneville, Tenn., claimed his first No. 1 qualifying position of the season, second consecutive at this track and 16th of his career when he drove his Team Mopar Dodge Avenger to a 6.668 at 206.89. Johnson, who won the most recent event in Englishtown, N.J., is looking for his second straight win of the season and first ever at his home track. Given the consistency of his new race car, Johnson feels confident about his chances to make it two wins in a row during Sunday’s eliminations. He will face Steve Kent in the opening round. Defending event winner Mike Edwards was second with a 6.678 at 206.42 in his Penhall/Interstate Batteries Pontiac GXP, while current national record holder Rodger Brogdon was third with a 6.696 at 206.45 in his Racers Edge GXP. 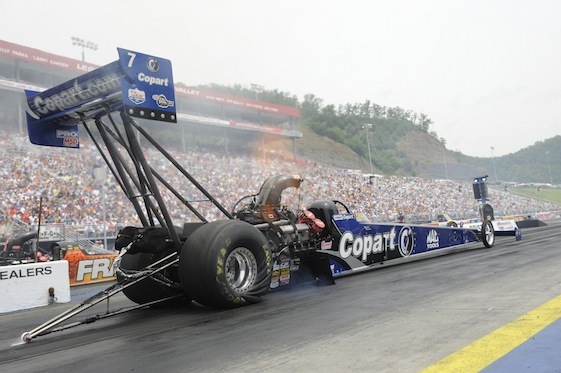 Sunday’s first-round pairings for eliminations at the 11th annual Ford NHRA Thunder Valley Nationals presented by Tri-Cities Area Ford Dealers at Bristol Dragway, the ninth of 22 events in the NHRA Full Throttle Drag Racing Series. Pairings based on results in qualifying, which ended Saturday. DNQs listed below pairings. Top Fuel — 1. Brandon Bernstein, 3.828 seconds, 316.52 mph vs. 16. Austin Lambright, 4.324, 287.84; 2. Larry Dixon, 3.831, 319.37 vs. 15. Rod Fuller, 4.309, 286.62; 3. Spencer Massey, 3.852, 321.73 vs. 14. Pat Dakin, 4.057, 296.76; 4. Doug Kalitta, 3.856, 320.66 vs. 13. Chris Karamesines, 4.038, 301.00; 5. Antron Brown, 3.864, 317.12 vs. 12. Bob Vandergriff, 3.906, 312.57; 6. Del Worsham, 3.865, 312.78 vs. 11. David Grubnic, 3.905, 314.09; 7. Terry McMillen, 3.879, 16.45 vs. 10. Morgan Lucas, 3.902, 314.02; 8. Tony Schumacher, 3.887, 318.92 vs. 9. Shawn Langdon, 3.889, 316.15. Did Not Qualify: 17. Troy Buff, 7.051, 103.06. Funny Car — 1. Bob Tasca III, Ford Mustang, 4.056, 314.31 vs. 16. Daniel Wilkerson, Mustang, 4.270, 285.53; 2. Matt Hagan, Dodge Charger, 4.082, 308.07 vs. 15. Paul Lee, Chevy Impala SS, 4.238, 296.89; 3. Mike Neff, Mustang, 4.085, 311.99 vs. 14. Tony Pedregon, Impala SS, 4.189, 300.80; 4. Jack Beckman, Charger, 4.087, 311.70 vs. 13. Jim Head, Toyota Solara, 4.168, 303.57; 5. Tim Wilkerson, Mustang, 4.087, 306.53 vs. 12. Melanie Troxel, Solara, 4.151, 305.91; 6. Robert Hight, Mustang, 4.090, 311.20 vs. 11. Ron Capps, Charger, 4.122, 305.98; 7. Johnny Gray, Charger, 4.101, 309.63 vs. 10. Jeff Arend, Solara, 4.119, 302.48; 8. John Force, Mustang, 4.114, 311.63 vs. 9. Cruz Pedregon, Solara, 4.116, 307.51. Did Not Qualify: 17. Brian Thiel, 4.291, 287.17. Pro Stock — 1. Allen Johnson, Dodge Avenger, 6.668, 206.89 vs. 16. Steve Kent, Pontiac GXP, 6.753, 205.19; 2. Mike Edwards, GXP, 6.678, 206.42 vs. 15. Richard Freeman, GXP, 6.752, 205.04; 3. Rodger Brogdon, GXP, 6.696, 206.45 vs. 14. Warren Johnson, Chevy Cobalt, 6.739, 205.35; 4. Erica Enders, Cobalt, 6.700, 206.04 vs. 13. Larry Morgan, Ford Mustang, 6.737, 204.63; 5. Ron Krisher, GXP, 6.705, 205.91 vs. 12. V. Gaines, Avenger, 6.736, 205.22; 6. Greg Anderson, GXP, 6.711, 205.26 vs. 11. Greg Stanfield, GXP, 6.729, 205.29; 7. Vincent Nobile, Avenger, 6.716, 205.88 vs. 10. Ronnie Humphrey, GXP, 6.719, 205.91; 8. Shane Gray, GXP, 6.716, 205.47 vs. 9. Jason Line, GXP, 6.717, 205.66.Did Not Qualify: 17. Steve Spiess, 6.765, 203.34; 18. Buddy Perkinson, 6.768, 203.55; 19. Robert Patrick, 6.779, 202.97; 20. Kurt Johnson, 6.784, 203.06; 21. Bob Benza, 6.795, 203.25; 22. Frank Gugliotta, 6.838, 202.12; 23. John Gaydosh Jr, 6.984, 198.52.